Blog | Bartok design Co. Blog – Page 39 – Bartok design Co.
What an excellent recognition for what we consider to be one of Japan’s great products! Here it is the picture of us enjoying the bath in early morning. No steam, as I have to keep the door open so the camera doesn’t get foggy ! 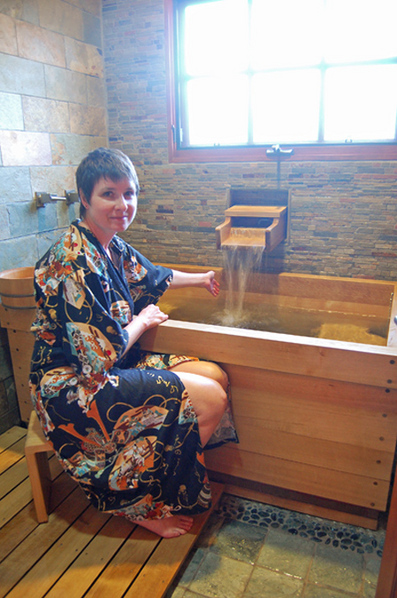 I wish you and your family a new year full of beautiful bathtubs all around the world ! Happy to help. We have enjoyed our bathtub tremendously. Attached are 4 photos for your use. We give you complete rights to use these images as you see fit. 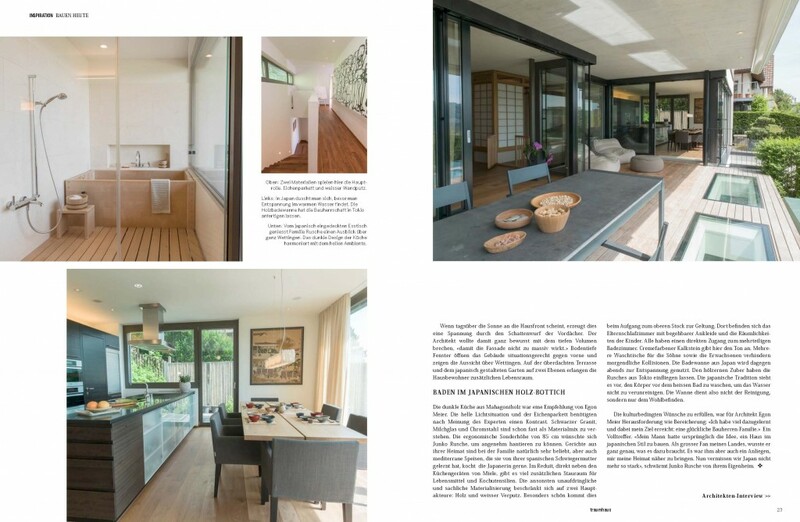 The house of a client in Switzerland will be published in an architectural magazine and – yes – the japanese hinoki bathtub also received a nice shot! I am looking forward to browsing the actual magazine! What is the feedback from your customers in Singapore – regarding mold experience on the bathtub. I am very worried about this, because here everything gets moldy, even shoes. About the mold: you should provide a good natural ventilation (open doors or windows after the tub). Forced ventilation alone, will not be enough. In any case, we treat the tubs with a hydro-repellent product (see here). “KIHADA ICHIBAN” is applied by brush or roller. It does not create a coat, it actually penetrates inside offering lasting protection whithout occluding the pores of wood. 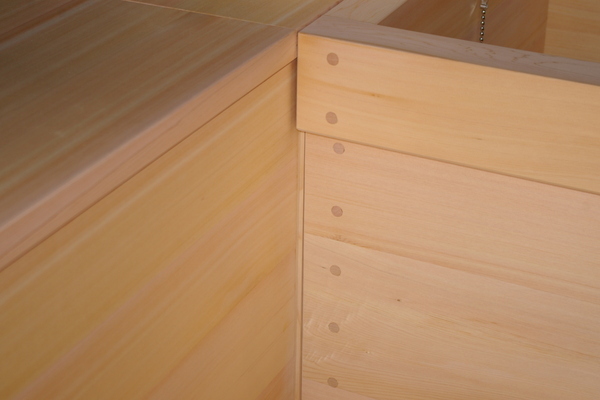 Hinoki wood is generally unfinished to convey its soft touch and natural aroma. Anyway, this new product (based on the nano-technology and using a fluoride base) operates like the silicates treatments used in europe to waterproof bricks or plaster. These products penetrate inside the material so they do not leave a peel, they do not alter the color, luminosity and aroma of the wood. We have been using this product for 4 years now. It is great to prevent mold and we did not have any claim from Singapore customers so far. 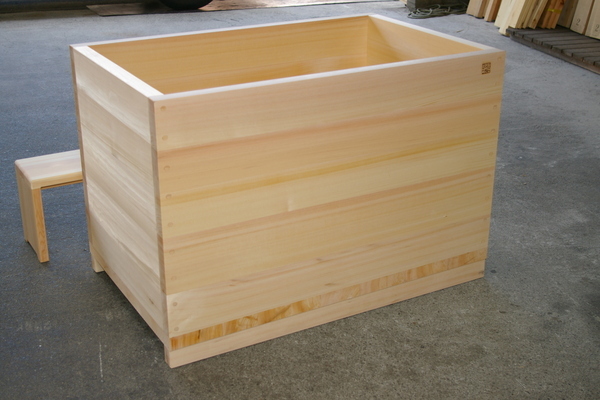 I read because your tub is planed, it does not need sealants or any chemical product. If soy sauce gets spilled on it and left to dry, would it stain or can be simply wiped off? 1) simply planed: in this case you have to wash away immediately any spill or it will stain. If you get a stain, blot wisely with some bleach and rinse promptly until the stain is removed. 2) treated with “kihada ichiban”. This product is a hydrorepellent which does not create a film on the wood. It is very safe and environmental friendly but it is a chemical product. In this case the spill will not penetrate the wood. The manufacturer warns that the hydrorepellent effect might diminuish after 2-3 years but in our experience we could not find considerable performance loss. What is the difference between hinoki and “Port Orford cedar” (Port Orford cypress, Oregon) for asthma? I am not a specialist but the composition of the resin within the wood fibers of Port Orford Cedar and Hinoki is very different. Actually one of the active aromatic components which has been isolated and is frequently used for viral protection and anti-allergic products is the hinokitiol. 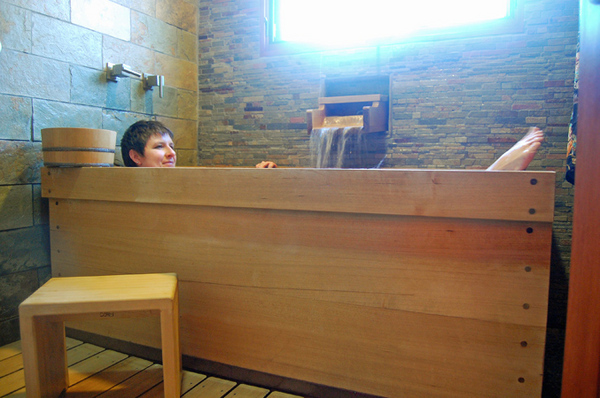 hinokitiol is present in Taiwanese hinoki and in Japanese Asnaro wood. 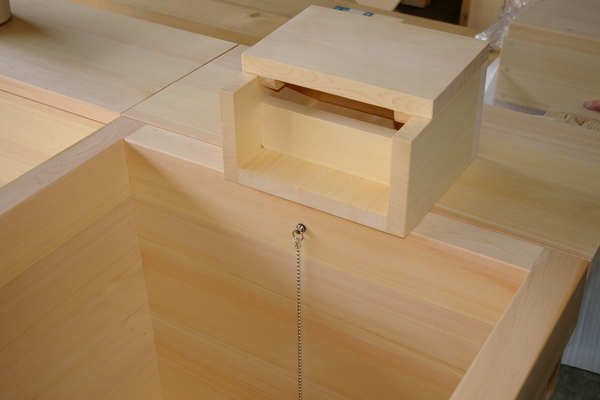 It is included only in small percentages in japanese hinoki! and if I am not wrong, it is completely absent in american cedars. If you are interested in the aromatic properties of this wood you might also consider ordering a bottle of oil and try if it works in your case. This tub will be employed in an apartment renovation in Rome. 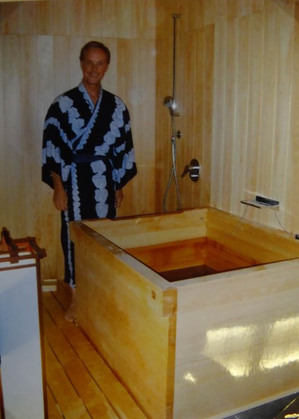 I saw the pictures of the present typical western style bathroom and I am looking forward to the metamorphosis into a clean design japanese wet room. Dimensions are: L1100mm x W700mm x H690mm (ext. dim.) 600mm (deep) . 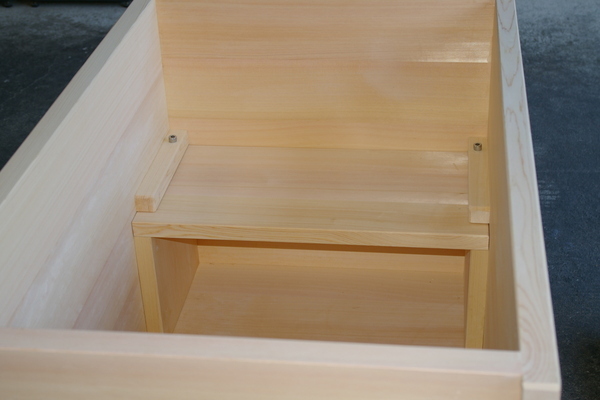 The bottom of the tub is finished with a copper apron and the joints are realized with wooden dowels. The tub has an internal bench and to offer the possibility to orient it left or right, the iron brand was applied on both front and back. 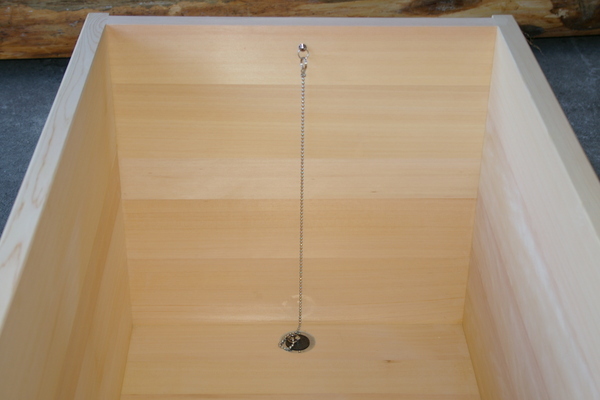 You can even see the drain fitting reflected in the polished wood of the interior walls! 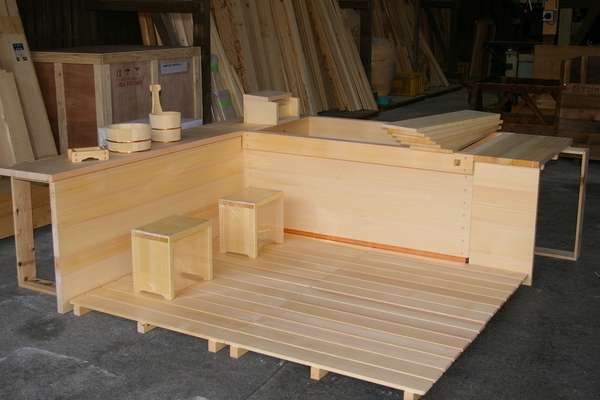 This is as close as you can get to a real all-hinoki japanese wet room. The ofuro is on the end wall in front of a large window, I assume the window is offering a stunnning view. 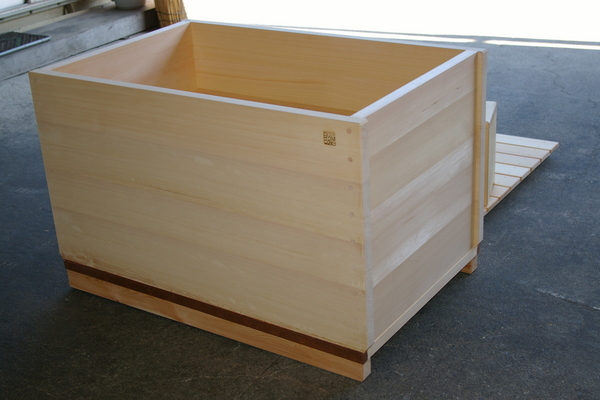 The tub has 2 ledges to fit seamlessly in the wall and a large 4-panels duckboard floor. Dimensions are: L1400mm x W750mm x H640mm (ext. dim.) 565mm (deep) . Accessories include custom built in ledges, traditional wood cover, full room floor grating panels, spout bathroom accessories (soap box, stools, buckets). Here is the detail of the spout. The lid is removable for maintenance/cleaning. 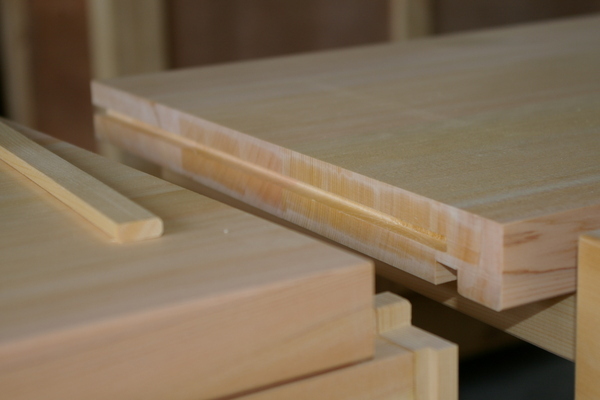 The corner joint is made in such a way that the water cannot reach the head of the planks (cut perpendicular to the wood veins) which is more vulnerable to water. And here is the detail of the joint construction. Yes, we had two orders from Singapore in one month! Do you know that is becoming very trendy to renovate a traditional Singapore row house (e.g. the Joo Chiat district) ? Well, this elegantly proportioned soaking tub will be used in such a project and I am sure it will do its part in adding up originality and charm to the interior. Dimensions are: L1100mm x W710mm x H750mm (ext. dim.) 650mm (deep) . 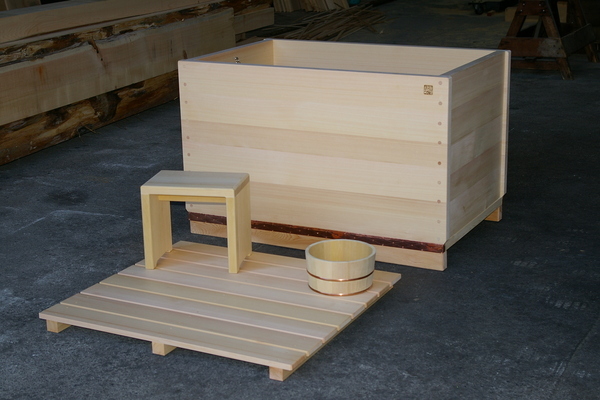 The bottom of the tub is finished with a natural oil and the joints are realized with wooden dowels. 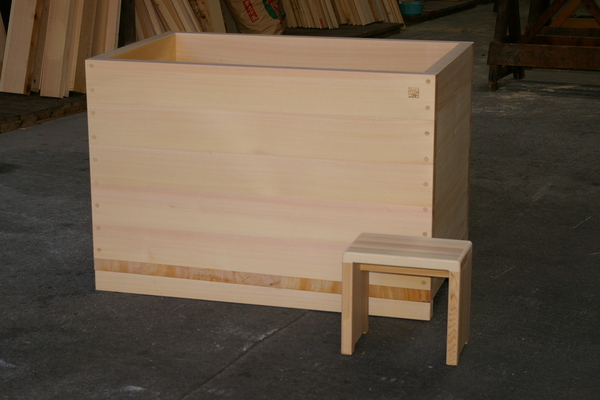 There is also a matching hinoki wooden stool. 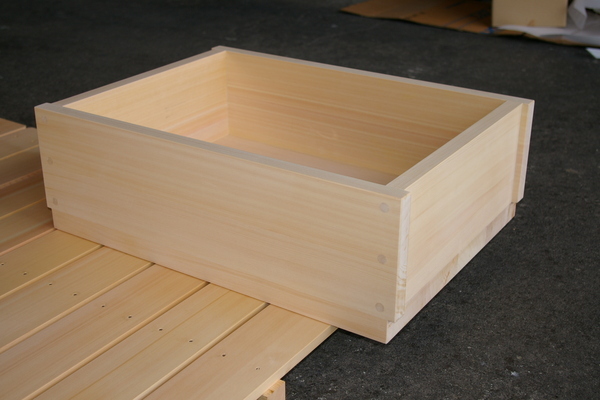 The layout was not 100% defined yet so we used completely knotless A grade hinoki on the 4 sides. This way the tub does not have a “back side” and can be orientated in any direction. 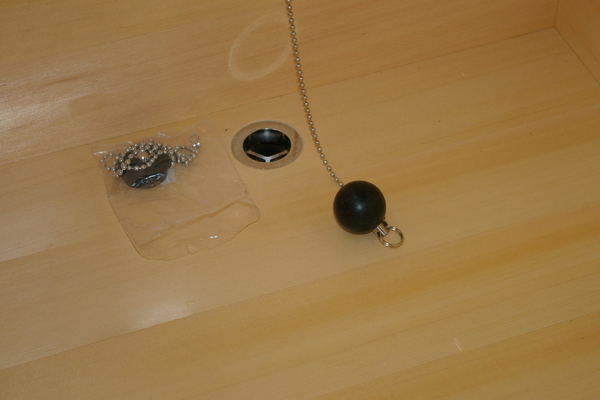 The client was not keen on our standard rubber plug, so we supplied a spherical plug (option). The design is pleasant and it will fit the drain hole at any angle!